China would step up its mediation and arbitration role for a potential third North Korea-US summit, Chinese observers commented Sunday, after North Korean leader Kim Jong-un said he is open to another bilateral meeting with US President Donald Trump if certain conditions were met. Kim made the remarks in his policy speech marking the First Session of the 14th Supreme People's Assembly on Friday, a day before he was re-elected chairman of the country's State Affairs Commission. "If the US adopts a correct posture and comes forward for the third summit with a certain methodology that can be shared with us, we can think of holding one more talk," Kim said, adding "It is necessary for both sides not to table their unilateral demands but find a constructive solution to meet each other's interests," according to Saturday report from the north's official Korean Central News Agency. Kim said "we will wait for a bold decision from the US with patience till the end of this year." 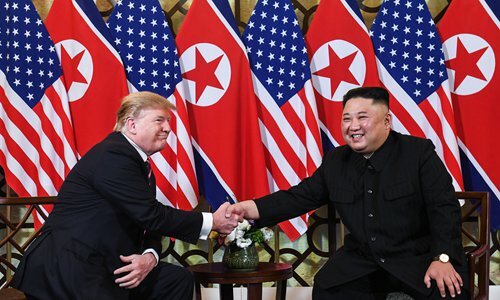 "Peaceful talks and negotiations remain the best way to achieve the goal of Korean Peninsula denuclearization, and the recent exchange of intent to set up another Kim-Trump summit proves again the idea is shared and agreed on by all relevant parties," Lü Chao, a research fellow at the Liaoning Academy of Social Sciences, told the Global Times on Sunday. "China, as one of the five permanent members of the UN Security Council, will continue to spare no effort to facilitate communication between North Korea and the US, and if it's likely there will be a third summit between the two leaders, China will also step up to play an arbitrational role, to ensure the results of the talks are durable, practical and favorable to both sides," Lü said. In his speech, Kim accused the US of only considering its own interests during the second North Korea-US Summit in Vietnamese capital Hanoi in February, which has led his country to question Trump's willingness to improve relations with Pyongyang. Lü said that the key to building enough mutual trust between the two to make a third summit possible largely lies in whether the US will send signals that show sufficient sincerity, including seriously considering a phased denuclearization approach, as opposed to its complete, verifiable and irreversible dismantlement policy, and partially lifting its unilateral economic sanctions imposed on North Korea. Zheng Jiyong, director of the center for Korean studies at the Shanghai-based Fudan University, said although no agreement was reached at the Hanoi summit, the two sides used the opportunity to better understand each others' bottom lines and their most urgent needs. A third meeting, which is only likely to occur after both sides calm down, would likely be oriented toward problem-solving and therefore more efficient and effective, Zheng said.